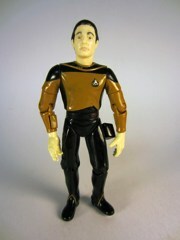 The Playmates Toys Star Trek: The Next Generation was the standard to which all other collector figure lines were judged in the 1990s. (This was after everybody ignored the Galoob line in 1988.) 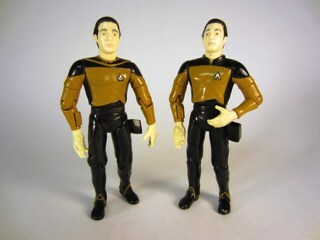 Good likenesses, decent accessories, lots of stuff, and the word "Collector" all over the packaging caused older toy fans to assume we were legion, but the truth is Lieutenant Commander Data in First Season Uniform and all the rest came into being because Star Trek had a big uptick in fans, namely school children, as TNG continued to succeed in first-run syndication. I was about 13 in 1993 and fancied myself a budding toy enthusiast, and I assumed I was buying a line of figures developed for grown-ups. And then I found out my five-year-old neighbor was buying these... and that a lot of Star Trek was by and large developed for kids, not all of it of course, but there was a definite effort to make sure it was accessible. So much for illusions! 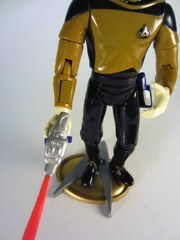 As an adult I still dig the franchise, and the abundance of Picards and Datas make more sense in hindsight. 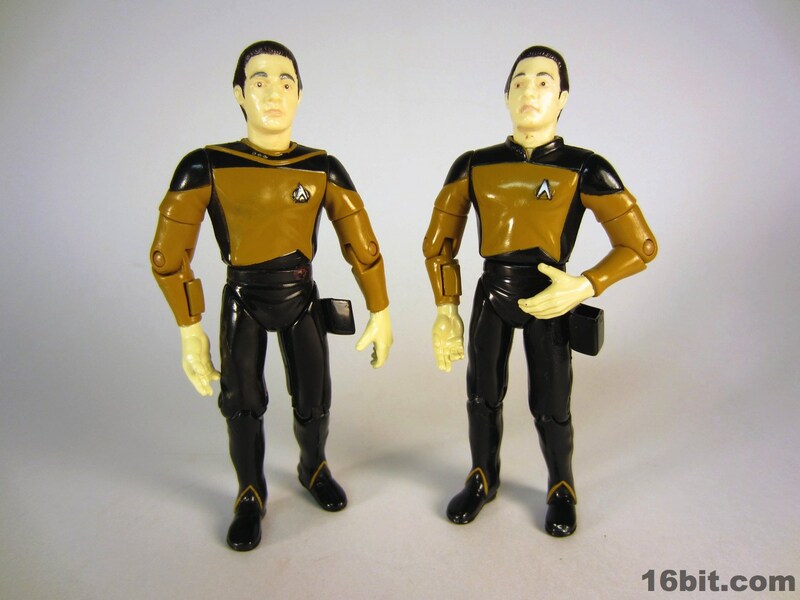 At the time, though, it was frustrating-- the 1992 series had 10 figures, and the 1993 series bowed with barely repainted/retooled versions of six of them, And they didn't even shave Riker! 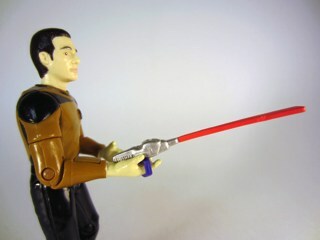 I daresay this was the first time I got pretty annoyed at a toy company. 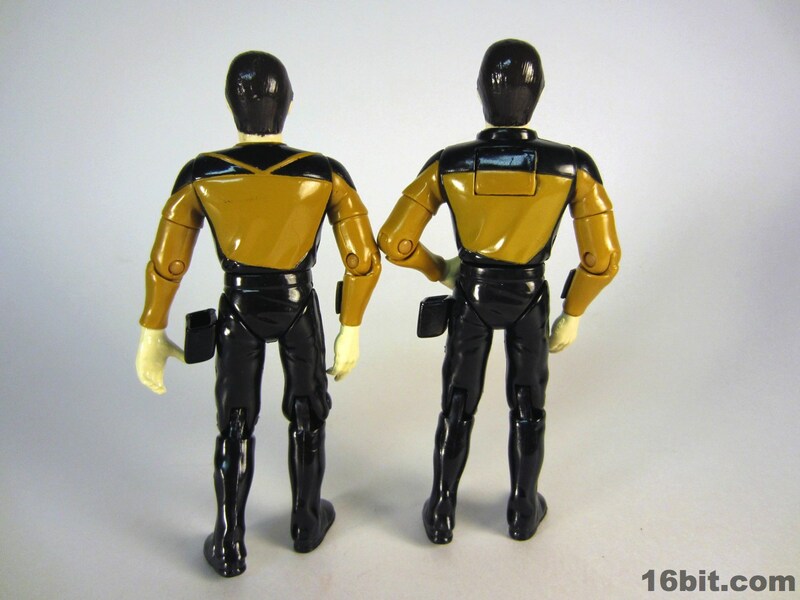 Based on the 1992 Data, this "Season 1" uniform version borrows heavily from the original release. 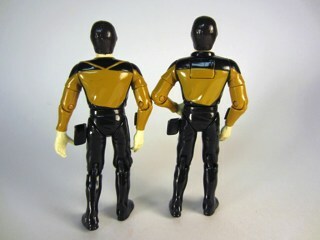 The torso was retooled to move the pips, to add the stripes on the shoulder, and to give it that more spandexy appearance of the show's earlier costumes while the arms and legs were fundamentally the same. 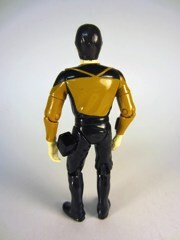 It lacks the seam down the middle of the shirt, plus it obviously hangs looser than the uniform on the show-- note a little "bunching" on the figure. It was damned tight on the show. Playmates did a good job articulating and painting its figures, giving it a then almost unheard of 12 points of articulation. 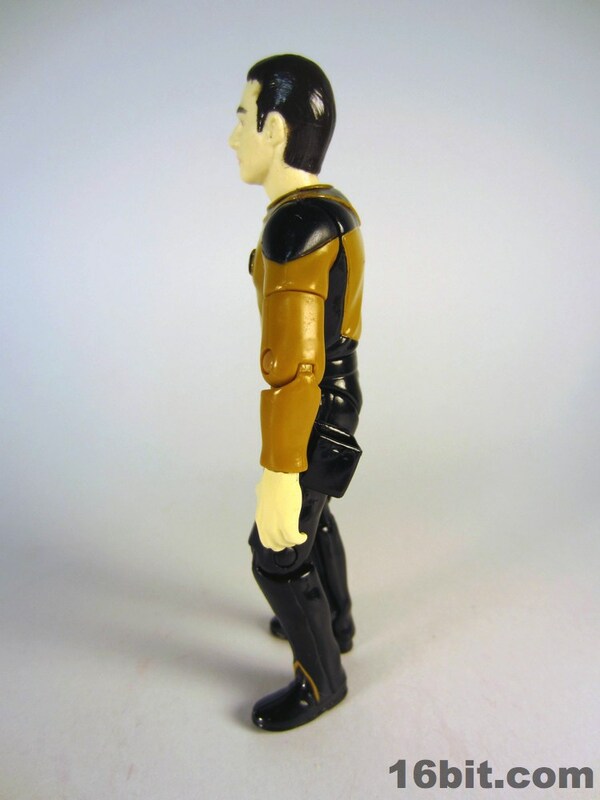 Kenner was still pretty big in those days, so anything over 5 was pretty impressive stuff-- unfortunately Data and his cohorts have the dreaded v-crotch, meaning they can sit. Just not very well. His deco is great, his pale skin is consistent, his silver eyebrows look more roboty than his TV show counterpart, and his accessories are all but unpainted. Other than phasers (or an occasional sticker), Playmates rarely decorated weapons in those days. While very few of these early figures had any gimmicks, Data did have some opening panels. (For kids, you see.) The Season 1 version reviewed here has an opening wrist port, but the previous release from 1992 had a back panel as well. Why the removal? I have no idea. Probably just so they could reuse the "season 1" body again if they were so inclined, Playmates was big on sharing and swapping parts in those days for this line. 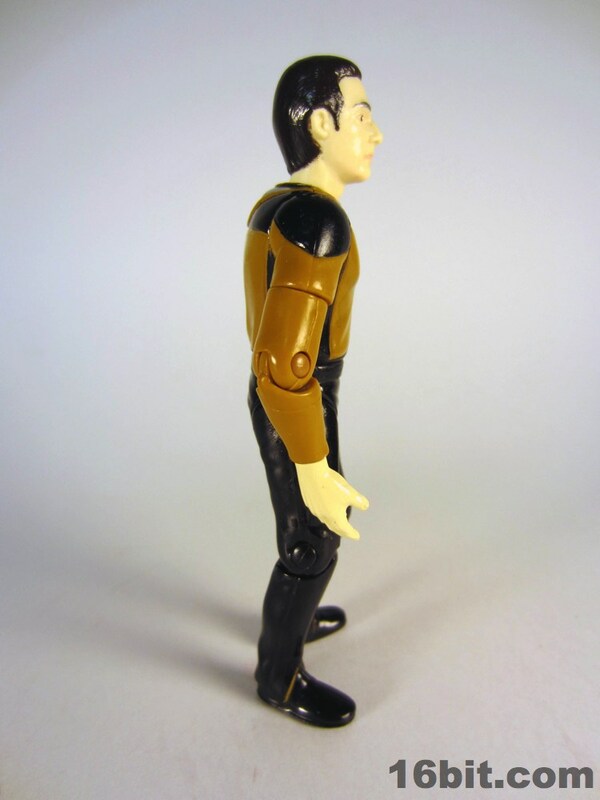 This was the kind of thing you used to see with The Six Million Dollar Man that had largely been excised from figures due to the smaller sizes. 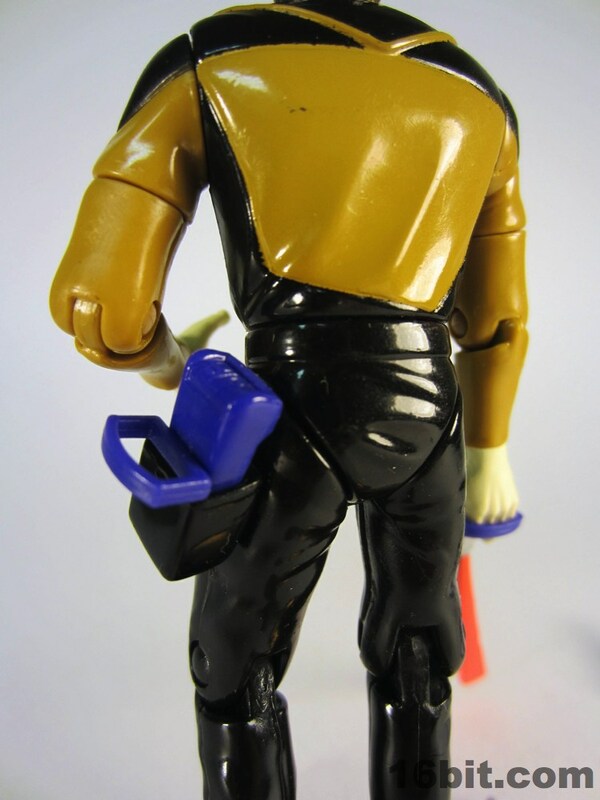 Data also sports a holster for his Tricorder, although it's a little tricky to fit as his accessories were tooled to have hand grips in order to better hold them. 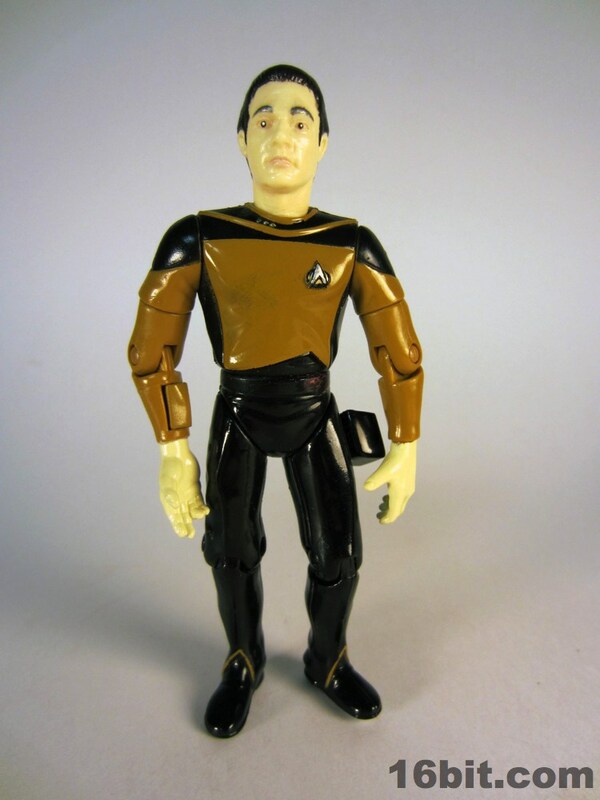 This figure was a pegwarmer in many parts of Phoenix in the 1990s, which I recall because I'd see tons of unsold Season 1 figures which were the sign that Locoutus and Dr. Crusher were there, I just missed them. If nothing else, the line gave me a crash-course on discovering how to tell not only what I may want to buy or to skip, but what I'm missing as well. If memory serves the figures shipped in cases of 24 in those days, a far cry from the 6-12 we see today in lines that don't involve teenage mutants. And the amazing thing was, they really sold well and sold through most of the time. 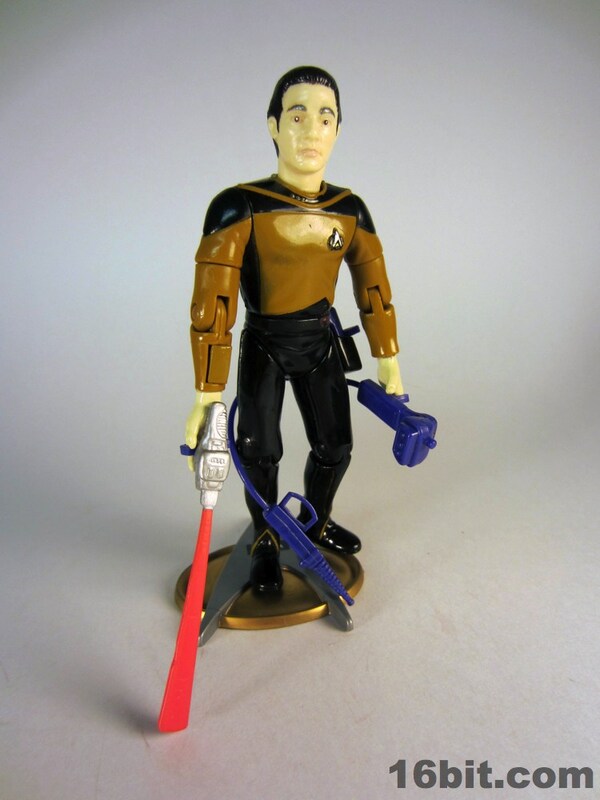 While we get some pretty awesome action figures today, nothing can top the 1980s for variety or the 1990s for the sheer insanity and rabid fandom. 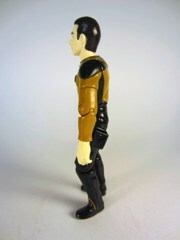 For all intents and purposes, this figure is worthless. And with good reason! They sold these everywhere-- Toys R Us, Target, Kmart, Walmart, Spencer's Gifts, Best, Kay-Bee Toys, Suncoast Motion Picture Co., and all the other places that no longer exist we used to hunt down toys at. 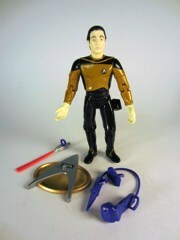 Somewhere between 200,000 and 250,000 are assumed to exist, which was normal for toys in the 1990s. Kenner wouldn't even start the engines for fewer than 30-35,000 figures in those days, which is one of the reasons the whole "let's do 1,701 editions" so horrifying to anyone who dared collect them all. 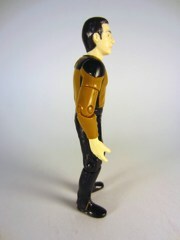 Today, Diamond Select Toys struggles to sell its 1,701 figures, and numerous companies have a hard time moving 3,000 units. How the times have changed! 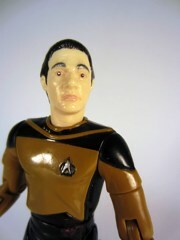 This Data can be had for a couple of dollars, and on eBay, that may be too expensive these days.